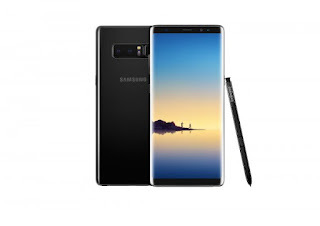 Samsung today officially launched Samsung Galaxy Note 8 in India. It comes with a 12MP Dual Rear camera and 6GB of RAM. It has a 12-megapixel primary camera with f/1.7 aperture and wide-angle lens and a 12-megapixel secondary camera with f/2.4 aperture and telephoto lens offering 2x optical zoom. Both have OIS.It has Iris scanner, fingerprint sensor, heart rate monitor, water resistant up to 1.5 meters of water for 30 minutes with IP68 ratings. It also has Bixby assistant.Bixby Voice will be available in India in the next few weeks. Samsung Galaxy Note8 comes in Midnight Black, Maple Gold colors Priced at Rs 67,900. Pre-Booking on Amazon India and Offline Stores to be available from 21st September 2017.Those who pre-order the phone will be eligible for one-time screen replacement and a free convertible wireless charger.